When rival neighbors India and Pakistan plan to meet, it often comes down to the wire – and this week is no exception. Two days before Pakistan’s National Security Advisor Sartaj Aziz is scheduled to land in New Delhi for meetings with his Indian counterpart Ajit Doval, statements from India’s foreign ministry Friday morning cast doubt over whether the talks would actually take place. The reason: another planned meeting between Mr. Aziz and separatists from the Indian state of Jammu and Kashmir at a reception at the Pakistan High Commission on Sunday. Through a series of tweets, a televised interview and a media statement, India hardened its stand against Pakistan’s decision to consult with Kashmiri separatists. The Kashmir region lies at the center of decades of enmity between India and Pakistan. Both countries administer parts of the territory but claim it in full. Vikas Swarup, spokesman for India’s foreign ministry, said in a tweet posted on his verified Twitter TWTR -6.19% account on Friday: “India has advised Pakistan yesterday that it would not be appropriate for Mr. Sartaz Aziz to meet with Hurriyat representatives in India,” referring to a group of Kashmiri separatists. Pakistan says these men must be consulted before India and Pakistan hold discussions concerning Kashmir. India resists the involvement of groups that have clashed with the Indian establishment for decades, boycotting elections and stoking tensions in the Kashmir Valley. Security officials in New Delhi accuse them of facilitating militancy in the region and colluding with Pakistan-based terrorist groups. If India cancels the hard-won meetings over the issue of Kashmiri separatists, it won’t be the first time. In July last year, Prime Minister Narendra Modi called off planned talks between the countries’ foreign secretaries after separatist leaders met with Pakistan’s ambassador to India, in defiance of New Delhi’s warnings not to do so. By cancelling the meet, Mr. Modi sought to set new ground rules of engagement between India and Pakistan – one Islamabad appears not to have been willing to accept. His statements are a second warning shot, after Indian authorities in Jammu and Kashmir temporarily detained separatist leaders on Thursday in an apparent signal of New Delhi’s objections. But Pakistan has so far given no indication it’s in the mood to compromise. Pakistani foreign ministry officials said the reception would go on as scheduled. The meetings may also fall apart over another disagreement: What will the two sides talk about? Pakistan has said the dispute over Kashmir will figure on the agenda when the countries’ top security officials get together. India says the meetings will focus only on terrorism. India accuses Pakistan of harboring militants who launch attacks on India and wants to press Pakistan further to take stern action against such groups. Pakistan denies allegations it backs militants, saying it too is grappling with terror against its citizens. In an attempt to clarify its position, Mr. Swarup said in another tweet Friday that India has “sought confirmation of our proposed agenda for the NSA level talks” – a typically behind-the-scenes detail whose public declaration by Mr. Swarup points to the lack of trust and widening gulf between the two sides. 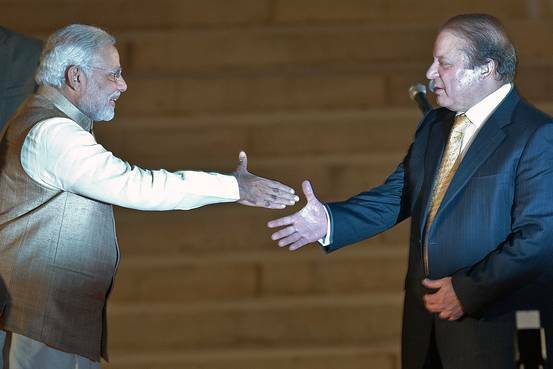 via India-Pakistan Talks Hang in the Balance Over Kashmir – India Real Time – WSJ.